I’ll Pass On Dessert It’s DTGD Time! This card was made playing around with some designer papers and a slightly different cut. The front of the card is roughly 4″ x 4″ while the back of the card is a regular size of 4-1/4″ x 5-1/2″. The flower was stamped, and water was immediately spritzed on it before the ink could dry. This allowed the ink to react and blend with the water on some areas of the flower. What lovely papers that go so well together and like the effect of the water on the flower. Thanks for sharing with CHN patterned paper challenge. So pretty, I like the cut away of the front panel, pretty touch on the flower, neat paper pattern combo and like the row of pearls! This color combo is stunning, the teal and pink look so well together. Thank you for joining Simon Says Stamp Monday Challenge. This IS an interesting cut! I love the watercolored look on the flower too. Lovely card with the pretty flower! Wonderful color and design! Sweet, thanks for sharing with us at CCCB! 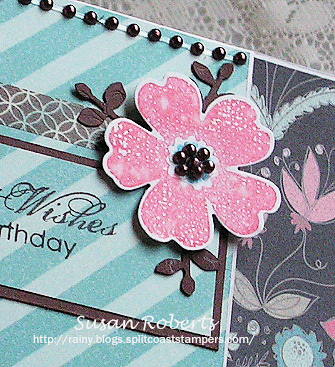 Beautiful card, Susan! Love the pretty colors and the great design! Oh, I like the unusual and very creative cut and design! I’d never thought of doing that with a top fold card, but I’ll file the idea away for future reference. 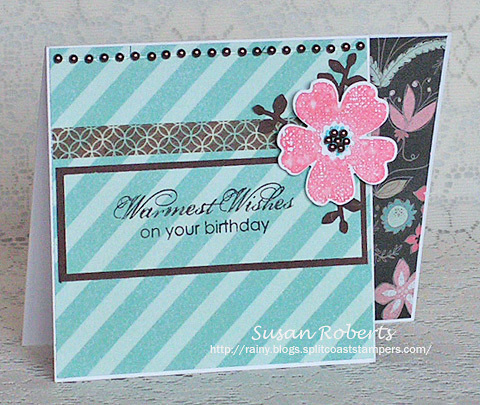 Love your use of the pretty designer paper. A wonderful and fun birthday card. Good to see you, Susan! Very pretty! Love the big bloom! Thanks so much for joining us at the Card Concept! Love the color combination as well as the beautiful flower! Thanks for sharing with us at The Card Concept and we hope you can join us again soon!